For those who think that political punditry can be, well, laughable at times, you’re in luck: There’s a new comedy troupe that has people just like you in mind. Pardon the Pundit, a year-old satirical website that pokes fun at the ways of Washington, is taking its brand of satire around town for a series of comedy events (or, as they call them, “Comedy Caucuses”). With a rotating cast of roughly six stand-up comics, the group put in two nights recently, performing at the Harman Center for the Arts. 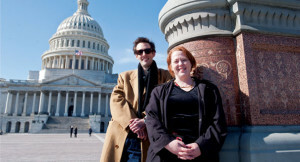 POLITICO caught up with two of them, Alyson Chadwick and Andrew Heaton, for an interview about their project. Chadwick has a résumé thick on politics, having worked for Sen. Dianne Feinstein (who Chadwick says is funny, in case you were wondering), Rep. Joe Sestak (not funny) and John Edwards (at this point, she doesn’t want to see him at any of Pardon the Pundit’s shows). To prove her street cred, she even has a donkey tattoo on her backside. “The GOP candidates make the ‘Jersey Shore’ cast look like intellectuals,” she jokes. Don’t tell that to Heaton, however. He also has worked on the Hill, but perhaps his most unique contribution to the Pardon the Pundit comedy company is less his experience in politics and more his politics views. For Heaton, the challenge of making conservatism funny in Washington is a Catch-22. On the positive side, Washington audiences are more up to speed on current events (“If I’m somewhere else in the country and I’m making political jokes, I can make jokes about how Republicans dance like this and Democrats dance like that, but here, I can make fun of Ted Poe, the judge, saying whatever and people might actually know what I’m talking about”). The downside for him, of course, is that it’s a heavily Democratic town. But for the Pardon the Pundit comics, the aim is for partisanship to take a back seat to parody. Jeff Mauer, another member of Pardon the Pundit, did this riff recently on D.C.’s architecture. “We really do need to laugh more in this city,” Chadwick said. Heaton agrees, albeit with a more conservative approach.